For adventurers and nature-lovers, arriving in El Remate, a town thirty minutes from the virgin rainforests of the Maya Biosphere Reserve, where Tikal is located, is akin to making a pilgrimage to the Holy Land. Here visitors are on the cusp of seeing the world as it has been for a thousand years, covered in the creeping vines of the jungle, shaded by the canopy of the trees and filled with wildlife that cannot be seen anywhere else on the planet. Jungle palms in the Tikal National Park. El Peten, the region where this biosphere is located, contains the last remaining tropical wilderness in Central America. Thirty years ago the land was remote, inaccessible and with few to no paved roads. Today, due to illegal logging and farming practices, population growth, and cut and burn techniques, the rainforest is shrinking. It is still a trek to get here, and the wilderness still exists, but it is easier to access now than in the past. A man walking carrying wood on the road in Peten. Efforts by archaeologists and conservationists are underway to try and preserve the integrity of the environment, but these efforts win only half the battle. The other battle remains with the poverty stricken inhabitants of El Peten who often are choosing between feeding their family and preserving the rainforest. It is easy to see why the rainforest loses. Our journey here hinged on my Guatemalan husband’s memories. He wanted to relive a teenage journey to the region and visit Guatemala’s most prized cultural possessions. Excited to retrace his steps, he invited his family to join us on the journey. As such, we had a group of 11 willing souls that submitted to the call of the wild, including his 95 year old grandmother. Our destination of choice was the ancient Mayan ruins of Tikal. 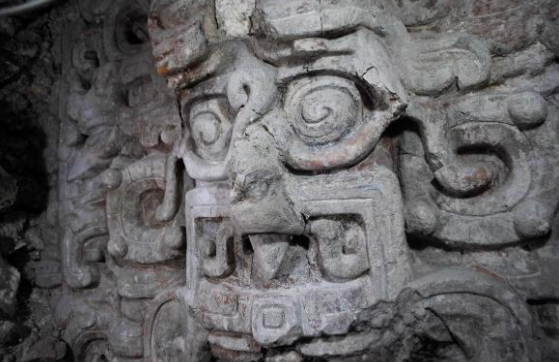 Ancient Mayan artwork on the Temple of the Night Sun behind the tomb on the Diablo Pyramid. Photo by: Edwin Román. The city of Tikal and its population developed and thrived from around 700 BC - 900 AD and then mysteriously and suddenly ceased to exist. This decline coincided with the mysterious general collapse of the entire lowland Mayan civilization. No one really knows why the Mayans who were a sophisticated, literate, mathematically inclined population disappeared. The best theory relates the disappearance of the culture to overpopulation and depletion of the rainforest, which is ironic. Perhaps current populations should look at the past before they destroy their habitat. Yet again, when faced with feeding your family or saving trees it is easy to see who wins. Motorcyclists brave the perilous roads often without helmets! There are many ways to arrive at Tikal. The easiest is to fly into Flores, Guatemala and drive the remaining hour to the park either by rental car or through a tourist agency. The second easiest way to get there is to drive 4 hours from Belize. The most difficult route is to drive 12 hours from Guatemala City. We chose the most difficult option, since we are thrifty and needed to pick up family in Guatemala City. If you have a weak stomach or are inexperienced on Guatemalan roads, I would advise you to not attempt to travel down this harrowing highway. It is a long, Latin-American rollercoaster of a ride replete with tight curves, absurd levels of traffic, extreme fumes, speed bumps and for better or worse, some prime people watching. Now that I know the road I would much rather shell out a few extra dollars and arrive by plane. None the less, that is the route we took. I kept telling myself, if my husband’s 95 year old grandmother can survive this car ride, so can I! Abuelita Tenchi, my husband's 95 year old grandmother, ready for the journey! After 8 hours of driving we decided to overnight in Rio Dulce and then continue our journey the following morning. As we drove into Peten the following day, the cities faded and quantity of people began to thin out. My husband was shocked at the difference in the landscape. He said that it seemed like much of the jungle had been exchanged for farmlands. With the Sierra de las Minas in the background, and a green landscape around us, the ride was scenic and pretty. Certain areas were very flat and had huge, tree-covered mounds jutting from the ground. My husband pointed them out and admitted that he thinks these are Mayan ruins in disguise. NASA mapped the area using remote sensing technology and discovered ancient Mayan highways that still remain hidden in the jungle. These ancient roads lead to cities waiting to be uncovered by archaeologists. Some discoveries are currently in process. This is indeed a land where one can live an Indiana Jones-like adventure. Listen to Dr. Hansen, the lead archeologist for the Mirador Basin Project, discuss in-depth details of his work on the Library of Congress you-tube site and you will be amazed at what you learn! We stayed at the comfortable Casa de Don David in El Remate. After 4 hours of driving through Peten we finally arrived in El Remate. We would begin our Tikal adventure early in the morning. For the record, waking to the sound of the jungle now ranks as one of the top ten experiences of my life. I had inadvertently forgotten to set my alarm the night before but was saved by the sound of squawking birds, buzzing insects and roaring howler monkeys. Who would have guessed that such a glorious, cacophony of life buzzed at sunrise? I only wish we had been inside the reserve to hear the sound at full throttle. Even being thirty minutes away was enough to send my blood coursing through my veins and make my spirit feel totally alive. Our guides (left), Abuelita boarding Tikal's transportation to the main plaza (right), our motley crew (bottom). We journeyed into the Tikal National Park with the help of two guides. Juan & Juan. Since my husband’s grandmother was too advanced in age to make the hike around the park, she was allowed to be transported into the central, main plaza and was given a personal lecture by Juan #1. My 5 year old nephew and my mother-in-law joined her. Hiking the trails in Tikal National Park. The rest of our crew hiked rapidly along vine-strewn, dirt pathways trying to stay up with our fast walking guide, Juan #2. He took us to the pyramids and temples, explaining in Spanish and broken English the history and mystery of the site. The view from Temple IV. For the Star Wars trivia buff, this location is used in Yavin 4 in Star Wars: Episode 4 A New Hope. The best part of the trek was climbing temple #4 and seeing the jungle from a bird’s-eye view. For as far as the eye could see, a vast ocean of green surrounded us. Ruins poked their heads above the jungle cover. Here we are in El Mundo Perdido excited to be looking at the fantastic canopy view. Estimates suggest around 300,000 people a year visit the ruins. While we were there we saw Europeans, Japanese, Americans and quite a few Guatemalans as well. The grand finale of the tour ended in the Plaza Mayor where the most iconic of the temples stands. This is the image that beckons tourists to visit. I learned that Tikal is just the beginning of a myriad of other, more remote sites that are possible to visit. Perhaps in the future I will have the opportunity to journey to the others including Yaxha and El Mirador. Until then, I will enjoy the memories I made in this beautiful and challenging jungle paradise. Have you visited El Peten? What natural or cultural adventures tempt you? Let’s talk in the comments below!